While Oconee County is promoting future use of gravity lines, the sewer line will be pressurized and will carry sewerage from the county’s commercial Epps Bridge Parkway corridor to the Calls Creek Plant, which is being expanded to be able to handle the increased effluent. A gravity line currently is being built along sections of McNutt Creek upstream from Epps Bridge Parkway. When that line is completed, sewage from as far away as Bogart will be pumped from an already upgraded pump station at the corner of Epps Bridge Parkway and Parkway Boulevard to the new Calls Creek plant on the northern edge of Watkinsville. The county gave Griffin Brothers Inc. of Maysville the notice to proceed with construction of the $1.9 million project on Nov. 1 of last year. At its meeting on Jan. 2, the Board of Commissioners finalized temporary and permanent sewer easement purchases from Tommy Kittle, 2030 Daniells Bridge Road, on whose property the line runs after crossing under SR Loop 10. Oconee County Water Resources Director Wayne Haynie said the contractor expects to complete work on the 21,300 linear feet of sewer line by July 1. Haynie told me in an email message last week he will need to ask the Board of Commissioners to extend the contract to accept that July 1 date, made necessary because of problems in manufacturing the pipes. Hurricane Harvey shut down the resin plans in the Houston area, causing the delay in manufacture of the pipe, Haynie said. The pipe will run under Epps Bridge Parkway at Parkway Boulevard and then follow Tanglebrook Drive to a sewer easement along a creek that links to the roadway through Pinewood Estates mobile home park. It then will follow Old Epps Bridge Road to the Oconee Connector stub behind Home Depot. From that point, the line crosses under SR Loop 10, connecting to Daniells Bridge Road just west of Chestnut Hill Road. 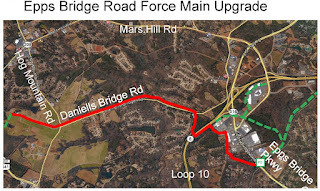 The line flows down the west side of Daniells Bridge Road to Hog Mountain Road and then down Government Station Road to Lampkin Branch of Calls Creek, where it will connect to an existing gravity line running to the Calls Creek plant off Durhams Mill Way on the north side of Watkinville. The new pipe will be put down beside the existing 6-inch forced main pipe following that same route. Water Services Department Director Wayne Haynie had said in July that he expected construction on the line to start in late September or early October, but that was before Hurricane Harvey hit Texas in late August. The contract allows 180 days for completion from the notice to proceed. The upgraded sewer line will allow the county to divert sewage now being pumped to the Land Application Site on Rocky Branch Road to the Calls Creek plant. The pump station on Daniells Bridge Road at Barber Creek will be put out of service by the upgrade but will remain in place in case of future need, Haynie said. The contract documents require that traffic will continue to flow on roads along the construction route at all times, Haynie said. Haynie said he expects to have the system operational by Sept. 1, in coordination with the commissioning of the opening of the new Calls Creek wastewater treatment plant, which will have a treatment capacity of 1.5 million gallons per day. The current plant has only a .667 million gallons per day capacity. At the public hearing last week on the county’s water and wastewater master plans, Haynie said one of his goals is to reduce the number of pump stations in the county. At present, the county has 35 stations, including the key one at the intersection of Epps Bridge Parkway and Parkway Boulevard. That Epps Bridge Parkway pump has been upgraded and will provide the power to flush the sewage from that location to the gravity line at Lampkin Branch. Because the county has not built any lines further down McNutt Creek or built a sewer plant on the Middle Oconee River to replace the Calls Creek plant, it is dependent on the pump station at Epps Bridge Parkway and on the forced main flowing from it to get sewage to the Calls Creek plant. The Land Application Site on Rocky Branch Road is operating at capacity. this is sad and horrible. I am new to this area, so please forgive me for asking, but are these sewage lines being added only for the benefit of the commercial sector of Watkinsville? I only ask because I just had to pay $950 to have my septic tank pumped out, and would like to know if the county has any plans for residential sewage lines for the real tax payers in the future? It appears that they could/should build a small plant along Mcnutt Creek to treat the waste water from the Epps Bridge commercial corridor using primarily gravity fed lines, rather than pumping it across the loop all the way to another part of the county only to put it in the same watershed further downstream. The planning seems illogical. The sewer line discussed here will have no impact on Watkinsville. 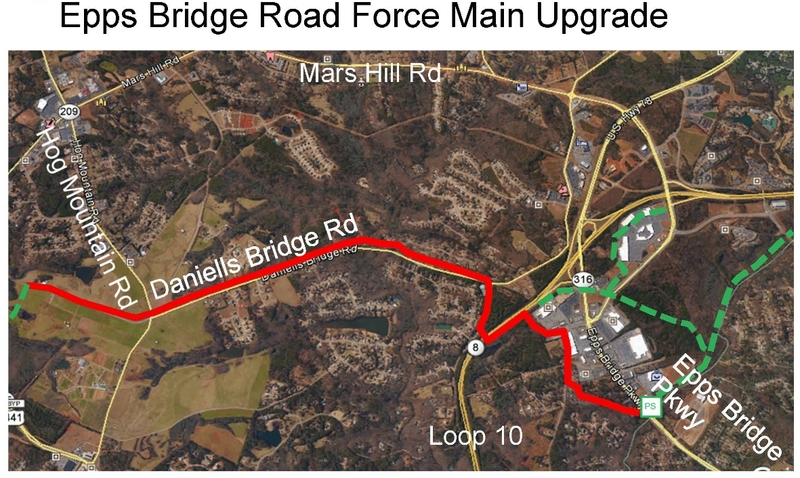 It will serve the commercial area along Epps Bridge Parkway and, ultimately, the area along McNutt Creek up to and including Bogart. At present, there are no plans to provide sewer service to areas currently served by septic. The additional residential sewer would be for future growth, not existing neighborhoods. The existing neighborhoods do not have the internal structure for sewer, having been built with the assumption of septic. One option being discussed is requiring future residential developers to include sewer infrastructure within the subdivisions.